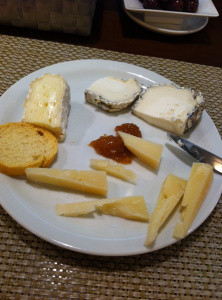 Having moved to Barcelona from Paris, I grew accustomed to having a large variety of cheeses from my local fromagerie. While I might not have access to the same number of cheeses here in Spain, I will say that I am impressed with the quality of some of the smaller production artisanal cheeses and am looking forward to seeing the variety grow. After the end of Franco’s rule, when Spain was modernizing, Spain chose rather industrial sanitary and safety measures for cheese manufacturing. This meant that more of the small scale, artisanal farmhouse cheeses could not be made because the traditional materials used were banned or sticking to such industrial standards cost too much money. Thus, most of us know only a few Spanish cheeses outside of Spain. I can’t wait to share some with you and Jane! This entry was posted on 24/11/2014 by RuedOdessa in Uncategorized.